When Robenson Cesar assembled a group of talented and committed teachers in 2009 to launch the Heart of Worship School, he told them “I want this to be the best school in the area. If you are ready to do it, let’s go. If not, step back. This is not a job, it’s a ministry.” And he also mentioned, by the way, you won’t get paid until we raise some more money. Eight teachers, many of them former students or friends of Robenson’s, jumped on board and started HWS on some savings and faith in their cause. Heart of Worship is in Viard, a few miles down a dirt road outside the town of Kenscoff which is high up in the mountains above Port-au-Prince. 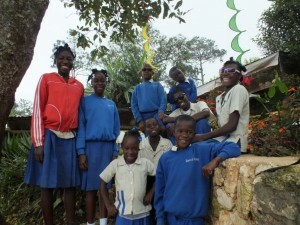 The area around the school has 500 families, most of whom are farmers growing vegetables in the cool mountain climate. Heart of Worship, with 80 children in a rented house, is the first school in the area; previously children walked as much as 5 miles to Kenscoff. 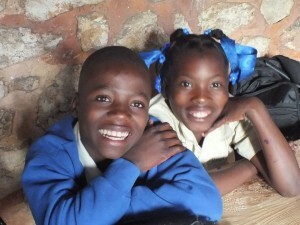 While some children have relocated from other more distant schools, Heart of Worship is providing many children their first opportunity to attend school. Although each of the eight grades (pre-K through 6th grade) have only ten students, it can be a challenge to accommodate 13 years olds in the same class 5 year olds in the kindergarten class. The teachers have agreed to stay after school and help the older kids catch up. In addition Robenson talks about creating an environment in which children “feel as good as at home, or better. Many children do not have an easy home life and they have never heard their parents say ‘I love you’ to them.” The school cultivates a climate of respect and support among the students and teachers. Echoing the teaching of progressive educators he has never studied, Robenson says he wants students in his school to learn that their own knowledge is valid and valuable. 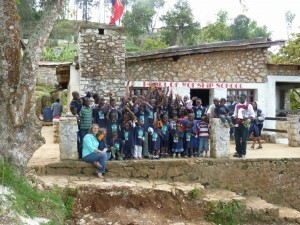 Much of Haitian education involves memorization and “sometimes they think they are worthless. 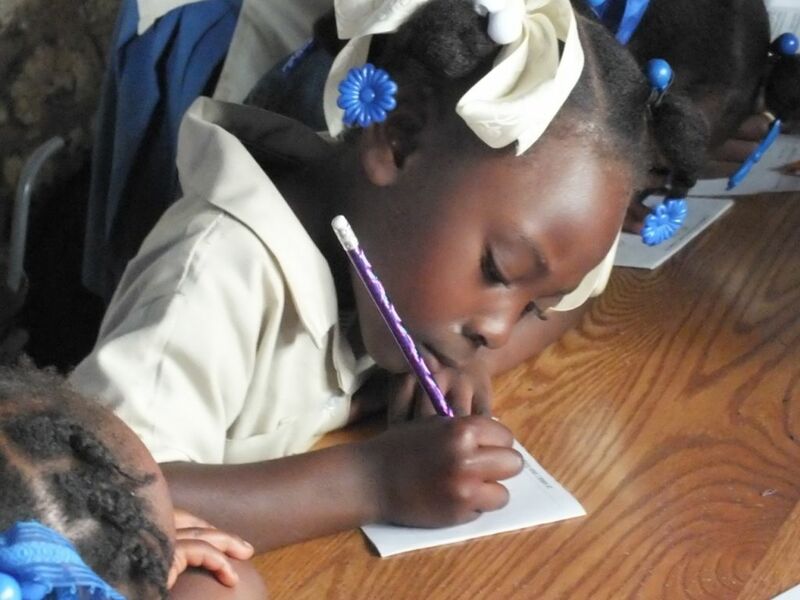 If they cannot do math, they think they are nothing.” Heart of Worship’s goal is to teach children to produce things using their own knowledge and skills. This could be writing, art or farming—anything that helps children recognize their own abilities and makes school an empowering, rather than a discouraging, experience. Heart of Worship has been open for only a few short months but Robenson’s vision and commitment caught the interest of Sionfonds staff. 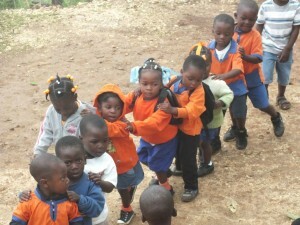 We will be working to make the school a success and provide a first class education to the children of Viard. Robenson, 32, is from nearby Kenscoff where his parents, although simple farmers, gave him love, encouragement and the chance to attend high school in Petionville, the wealthier suburb of Port-au-Prince. After high school, Robenson studied English, accounting and computers for a total of eight years. During this time he supported himself by teaching English and working in an orphanage. 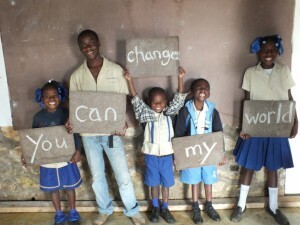 It was at the orphanage that he realized that sitting behind a computer analyzing data would never make him happy and that his passion was working with children and “helping them grow.” Robenson had been paying school fees for a handful of children but felt he could have a bigger impact with his own school. After the earthquake, he decided the time was right.